Ha ha ha ha! This one is funny. I have no idea if it means what it says or if this is kind of like people looking for someone to "ski" with on Craigslist (aka, do coke. Mom, don't ask why I know these things). A Southern widow, stranger in this city, would like a sleighride; turnout must be good and owner a gentleman; triflers need not reply. Address Snow Storm, Herald Uptown office. What? I really don't know if this is for real. I guess, you know, why not? And yet, what a strange request! I get the impression from the little bit of Googling that I did that a "turnout" is another word for a sleigh, which makes me think this is serious. Maybe she's a south Georgia peach who's never seen snow before, is on a trip alone to New York in February for some reason, and seeing all these people riding around in sleighs and wants a go. So, she advertises! And why not? Doesn't this look like fun? Maybe we should try to hook her up with the guy from yesterday, and he could teach her how to skate! 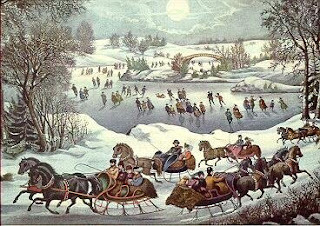 Or maybe "sleigh ride" is another way of saying that a girl just wants to have some fun but in a way that can't be openly advertised in the nineteenth century. Anything's possible...but I prefer to think that she really just wants to experience a real sleigh ride. Sunlight - Sweet existence, have pity on me. I love you as I do my life. Stop and see me before you go to matinee. Hi Babs, thanks so much for these kind words! I'm glad you are enjoying the blog! !